One of our favourite retreats is Dartmoor. The moors offer us tranquillity and space. The weather systems are frequent and short-lived giving wonderful scenery, colourful fauna and pasture for cattle, sheep and the Dartmoor ponies who roam freely across the moors. We use the moors as a stopover for one or two days on our trips to Cornwall to see family and friends. We have never been disappointed. We have journeyed through the moor as the winter snow melts and rivulets gather speed as they rush down the hills, cross the roads and wend their way into the valleys. We have seen the stubbly grass parched because of a hot summer sun or in contrast a wet, penetrating mist soaking everything and reducing visibility so much that the livestock use the tarred road as their hot water bottle and loom as large, grey objects blocking our progress. Very old inns on Warren Hill and in Widecombe are enjoyable, rustic buildings that have stood the test of time and continue to offer refreshment to travellers, the locals, ramblers and the bus loads of sight seers during the summer months. I have realised how much we are creatures of habit as on each visit to the moor we frequent one or other of these inns for our lunch and evening meals. 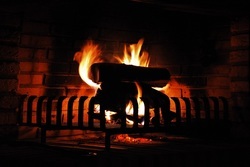 During the winter months we are often the only customers sitting by a log fire, having a drink, reading, talking or writing on the computer until it is time to have our evening meal. One particular afternoon an elderly gentleman was sitting in front of the fire. He was drinking a tankard of beer and reading the newspaper. I will call this gentleman the resident. We settled down to read and write while enjoying our drinks. Minutes later a visitor arrived and our peaceful pre-dinner drink was sadly interrupted by a heated argument. The writing gradually ground to a halt and it was difficult to concentrate on the book I was reading. It would have been difficult to remove ourselves as we were tucked into a small corner, and it was just as difficult to not pick up the gist of the argument. We were glad that no blows were exchanged and that it came to an abrupt end with the visitor making a quick exit. The resident returned to his drink and reading of the paper. I pondered what had happened at the inn that afternoon because the gist of the argument was so common place. ‘I asked you to do this, do you realise the inconvenience you have caused?’ The reasons were not really listened to as the point of the accuser forcibly restated the injustice that had been done to him. However, the defence was pursued just as vehemently and I very much doubt if either one was listening to the other. The accuser was a little bit worse for wear and added to the stress of the situation. Oh dear! I am sure that this unpleasant situation could bring back echoes of the past for many children and spouses. How many friendships and work situations go wrong because of wrong influences undermining sound judgement, loyalty and relationships? Think of the fear that is instilled and surfaces in someone when they hear and see raised voices or fierce looks – the narrowing of the eyes and lips drawn in a thin line, speaking through clenched teeth in a cold, clipped manner. The panic as crockery smashes, furniture is thrown about and the screams or screeching car brakes followed by an eerie silence. Whether it has minor or larger consequences all arguments destroy a sense of togetherness and value. The argument we witnessed ended as quickly as it had begun. The resident picked up the paper and drank his beer as though nothing had happened. Would the visitor continue their relationship? Would anything change, in this case would the request be fulfilled? Would these two gentlemen be more sensitive to their surroundings next time they needed to sort something out? In other words would they reflect upon, talk together and learn from what had transpired between them? Would they realise that there needed to be apologies for their intrusion into other peoples’ privacy and the effect they had on each other and those caught up in their row. I hope so but I have my doubts.